Darklord - King of War: Nick's CoK Is GORGEOUS! 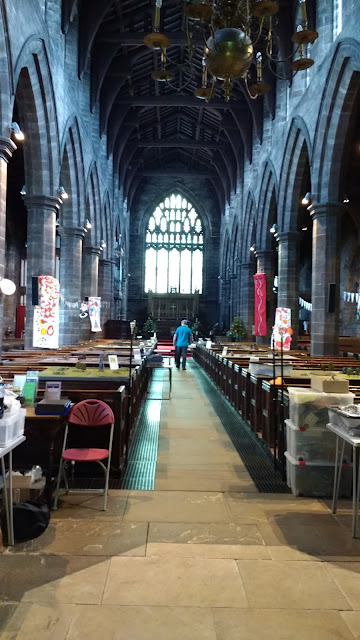 A Haven tournie report. Nick's CoK Is GORGEOUS! A Haven tournie report. 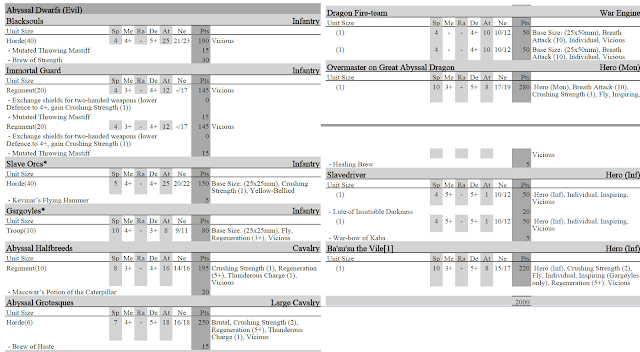 I was very happy with my Varangrr army after Lonewolf so decided to leave it as is. 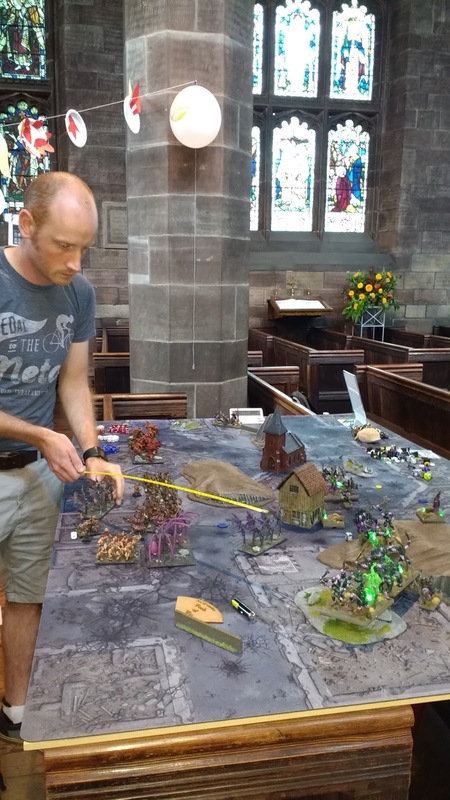 It was unusual in that it was 1250 points for the first two games and 2000 points for the final two. This mixed things up nicely, I’d happily play this style of event again in future. My 1250 list wasn’t quite perfect but won all 4 practice games so I was happy enough with it. This event had a once per game reroll of up to two dice. Nick getting ready for CoK action! 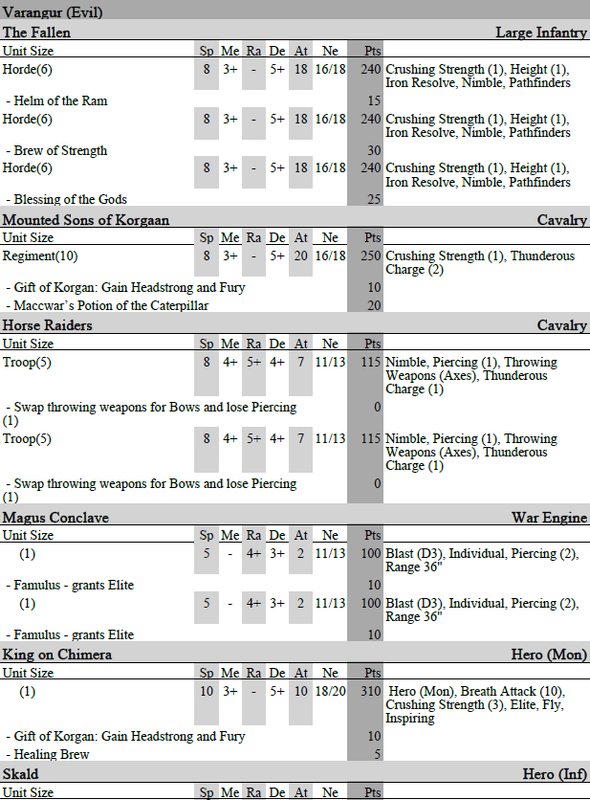 My army had to have a named General character who would be present in both lists, I chose the King on Chimera. Andy had been talking about his perfect record of wins vs RC/FFS, and how I’d mysteriously been avoiding him at tournies! (Hah!) So I decided it was high time to challenge him. 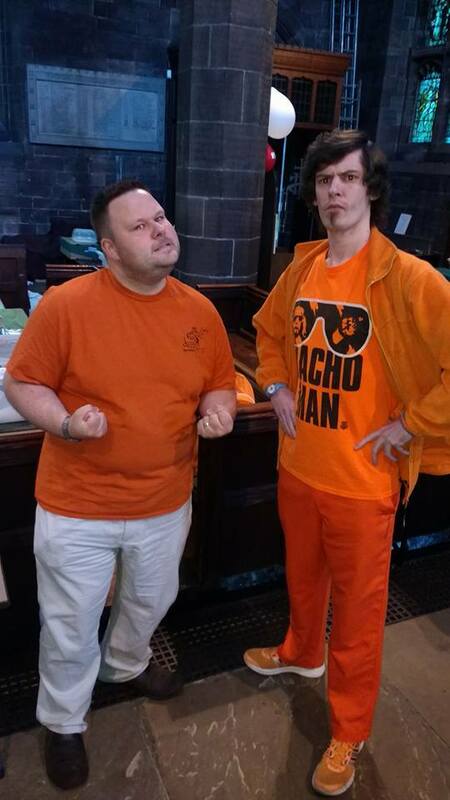 ;-) Andy accepted, so the Orange off was on! He had a decent list, although I don’t think he’d used it at 1250 before, so was still finding his feet with it. 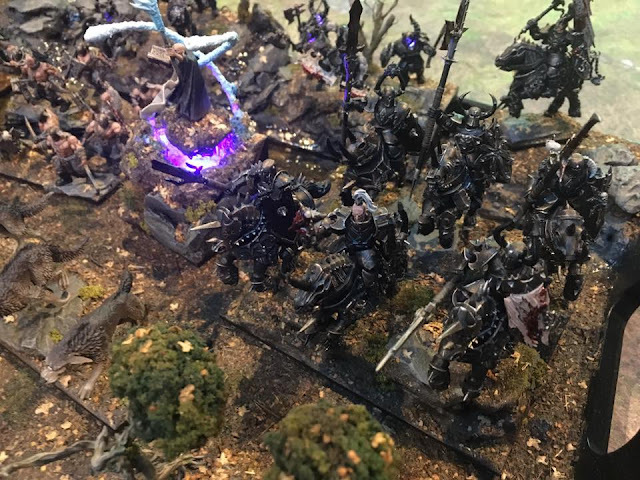 I moved up to the difficult terrain on the right flank and shot at the Ghouls taking them out over a couple of rounds of shooting, the Ghouls on the other flank wavered to shooting but refused to die. Meanwhile my Raiders got flanked by a Horde of Skeletons who despite 50 attacks on them they managed to do a mere 3 damage! O.o They did kill them a turn later but this allowed my King on Chimera the time he needed to finish off the Wurm safely. Back on the right the Werewolves came in, bounced and got eaten by my Lycans, over the next turn or so. The Revenant Knights and the mounted Rev King then also came in, but got eaten too. 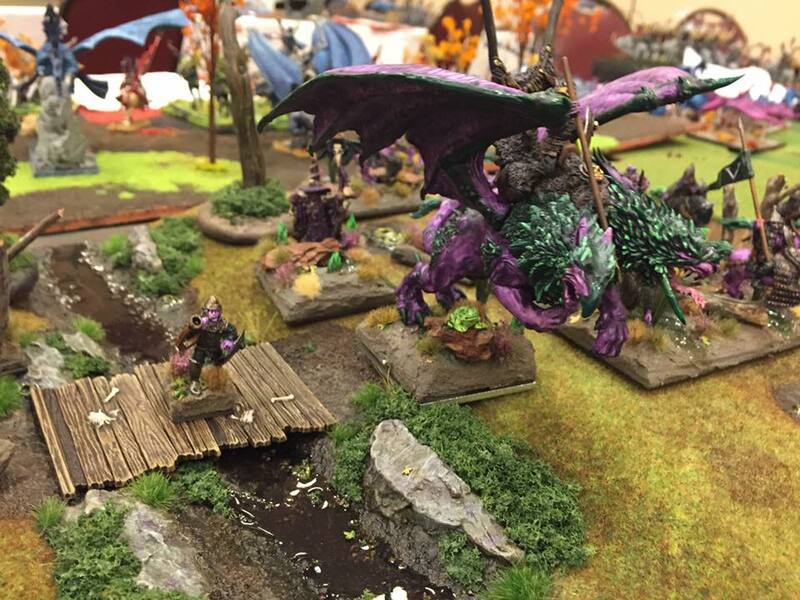 My King on Chimera jumped into the flank of the Wraiths who had been chewing on my Magus Conclave, and routed them. That just left the Skeleton Horde, which I danced about and finally finished off with the Chimera and Horse Raiders in their rear for a big win. 20 pts to me. Ross had a really hard list, fortunately I had a speed advantage, which I knew I could to my advantage. Early on Ross had a stroke of luck killing a Horse Raider troops after causing just 1 point of damage, double 6! 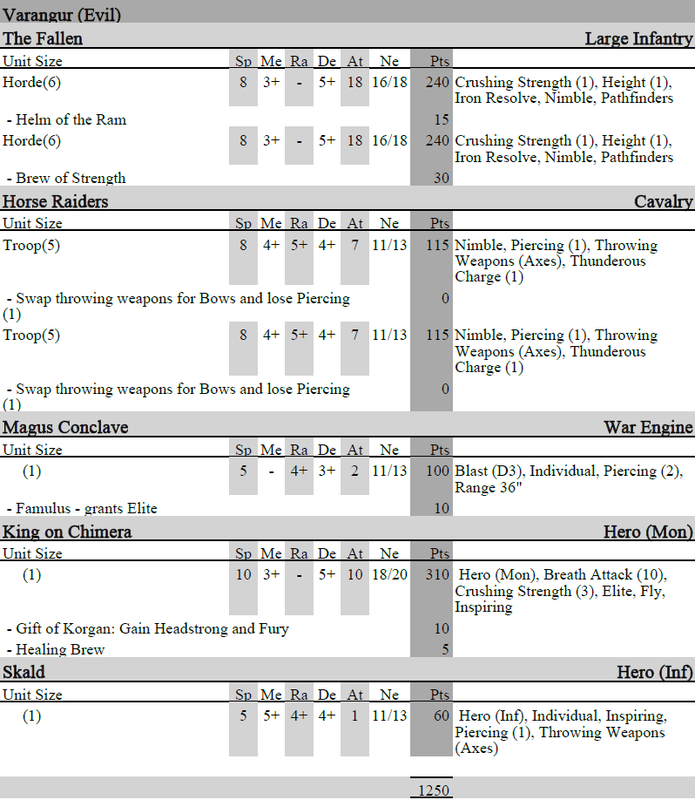 :p This would prove to be critical later as I really need those troops to take objectives for me. My Turn 5, this left Ross with the Militia Horde, the Honor Guard on my left, hiding in a wood, and a Halfling Sorcerer. It looked pretty good from where I was standing, however here is where I got cocky… I decided to send both Fallen after the Honour Guard, they were easily routed. The King was hit with the Sparkstone, so walked over to an objective. Ok it’s now my turn 6, erm I have one objective worth 3 and so does Ross… (the Militia held one) If the Chimera could fly I’d be fine, but the Sparkstone struck again and I can’t get to another objective… The Fallen move back and grab the Chimera’s objective and the Chimera limps forward, I need a turn 7 to take another. Game end turn 6 for a draw… Bother! On the bright side I had killed so much of Ross’s army that I still scored 15 points. Ah the beautiful Nick! 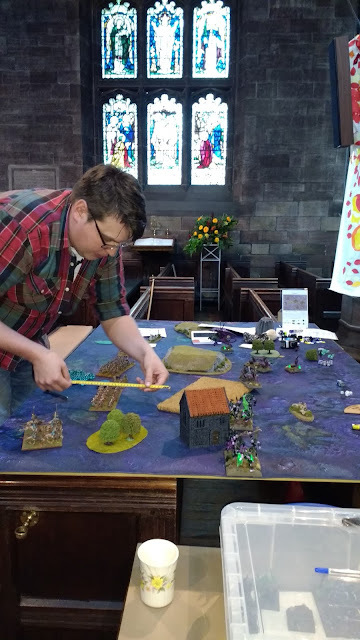 He should have been a table below me, but got pulled up to prevent Ross and I playing again. Nick and I are both RC, FFS members and have been friends for many years so I was looking forward to this! Nick’s list is very good, subtlety so. (bar Basususususussu, he’s as subtle as a brick) He’s also a great player ranked 5th in the UK at the time but about to go up to 4th I believe. He’d also never beaten me in any proper game of KoW! This was an interesting scenario; I had to Kill Nick’s horde of Black Souls, Grotesques and his Dragon. He had to kill my Fallen with the Brew of Strength, my Mounted Sons and My King on Chimera. In the centre I advanced my Mounted Sons and a horde of Fallen, this turned out to be a TERRIBLE decision, Basususususu charged in did a chunk of damage to the Mounted Sons, worse Nick had set things up so if I counter charged I would then be hit by the Grotesques, so I backed them up and set the Fallen up for a flank charge. Sounds sensible? 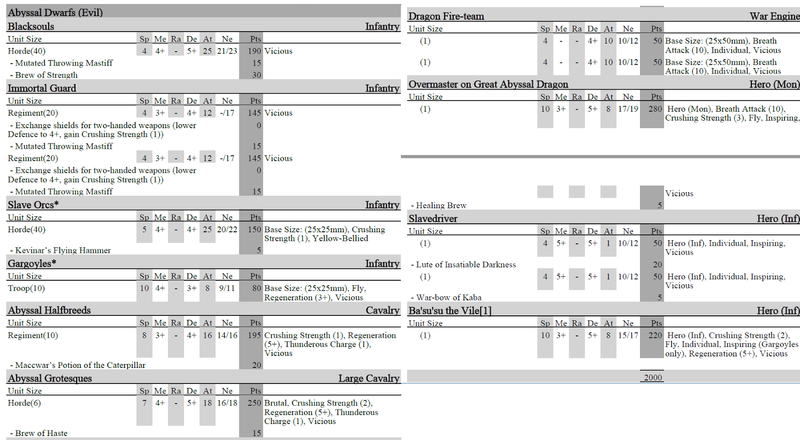 Nicks turn 2 saw the dogs released at my Fallen, 45 pts worth of dogs, did 10 damage to them and routed them in one go… (needing 8 twice to rout) Worse still Basusuu charged the Mounted, and rolls 9+ twice and routs them as well! This was unexpected and saw a huge gaping hole in my army… Also that was the first of my Bounty units eliminated in Melee giving Nick 2 points. 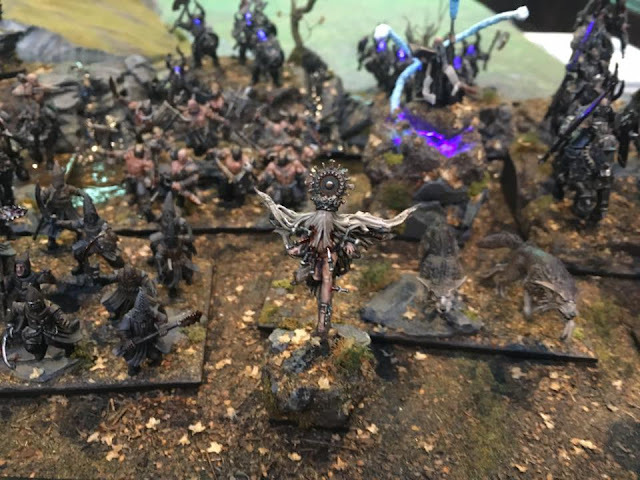 On the left I have a chance to take out the Blacksouls horde, I see that Nick has left his characters on the hill and I can charge and kill both with my last surviving Horde of Fallen and then also get a flank charge into the Black Souls. And here is where it unravelled. Nick and I hadn’t discussed the Hill, I assumed that the entire terrain piece was a hill, Nick was assuming the flat part of it’s rim wasn’t a hill, both we’re possible assumptions. Here I let Nick off as it seemed the sporting thing to do. However it had repercussions! That meant I would not be able to charge the Slave Driver. So in retrospect I should have at least diced off on whether I could charge the Slave Driver, and perhaps asked for a judges decision on front/flank of the Black Souls. If I had of got into them even on the front I could well have routed them. And if not at least I could have used my Fallen to do something more productive. As the Fallen ended sitting there they were then charged by the Black Souls and died. Very fun game and Nick played well here, he protected his units, where as I was far too gung ho, I need to learn that sometimes it’s better to accept you won’t get a big win and instead play for smaller wins sometimes. Congrats to Nick for finally beating me! 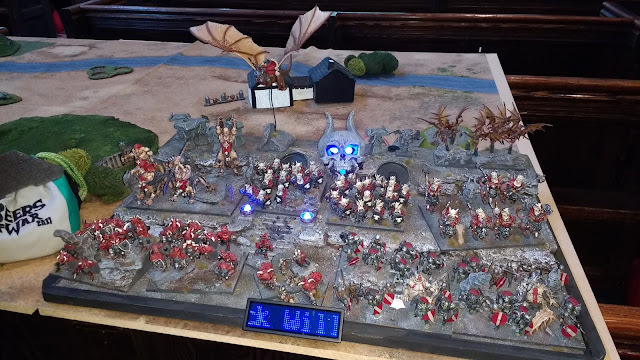 Nick's gorgeous army with display board. This game got off to a great start when I advanced my King on Chimera right in front of Alan’s army, but behind Height 3 impassible terrain, make him unchargable but able to charge almost everything himself. Alan cannily advanced using his Gargoyles to block all my Fallen charges. 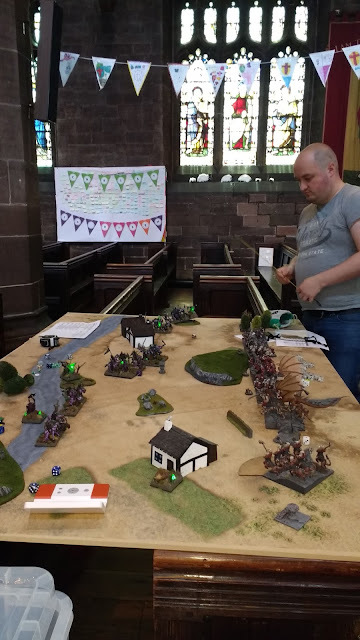 I thought quickly thorugh the next few turns in my mind and realised Alan would likely come off better so my units all backed away, bar the King on Chimera who got a flank into the Abyssal Berserkers, I routed them in one, turned and he was now behind Alan’s army. OUCH. Alan had placed his slow Golems on my right, with no objectives at all. I delayed them with my Horse Raiders keeping them away from anything important till later in the game. 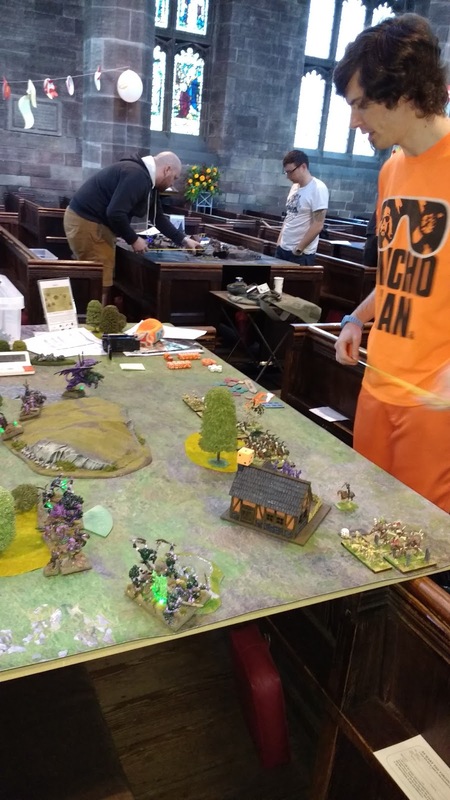 Back on my left Alan advanced and took flight from my Chimera with his Half breed champion, however spotting this I had angled it, so I could still single pivot rear charge Alan’s Abyssal Grotesques, this proved decisive and the entire flank fell apart over the next turn or two. That just left the Golems, they managed to get some damage onto my Mounted Sons which I think wavered them but thankfully Fury allowed me to counter charge and then rout them, Leaving just the Iron-caster alive, at which point Alan conceded. Fun game, but it shows how just a few mistakes can be so critical. Was nice to play Alan, and I think he’ll be extra careful next time! 20 point win for me. The results were in and Tom had won overall, Nick came 2nd and I limped in at 3rd place just pipping my friend Jez by a point who came 4th! Paul my padawan learner also did really well with both 5th place and Best painted. (I can claim to have helped his battle skill, but the paint is nothing to do with me. :p ) Michael got best sports. Well done guys! Haven was a really fun event, Hal excelled himself, and Andy helped too. The food was particularly good and the setting was beautiful. Thanks to all my opponents for some great games. BASUSUSSUUSUSU! Grrrr those flying individuals are so useful, I’m really starting to think I am hindering myself by not bringing Herja or something similar I shall be having a tinker with my lists, and she may be coming out to play at my next event.